This fireball flying over Texas was captured by a Police car video camera on Feb. 1, 2012. A bright fireball streaked across the nighttime sky over eastern Texas and Oklahoma last week, and was caught on video by a police car camera. The spectacular light show, which occurred Feb. 1, was likely caused by a car- or bus-size asteroid falling through Earth's atmosphere, Bill Cooke, head of NASA's Meteor Environment Office, told Spaceweather.com. A number of witnesses spotted the show. "At approximately 756 p.m. CST, over Abilene, Texas, I saw an object falling from the sky much brighter and long-lasting than anything I've seen," observer Daryn Morran told Spaceweather.com. "[The fireball] lasted close to 8 [seconds] before completely burning out. At first, it was bright white, and then started slowing down and getting brighter. Then it exploded like a firecracker artillery shell into several pieces, flickered a few more times and then slowly burned out ... awesome!!!" 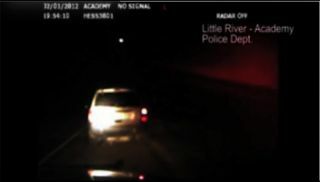 The video of the fireball was captured by a camera mounted on a police car dashboard belonging to the Little River-Academy Police Department in Little River-Academy, Texas, about 70 miles north of Austin. National Weather Service meteorologist Joe Harris, based in Fort Worth, Texas, shared with Spaceweather.com the account of another eyewitness, who reported a "double boom heard at 8:00:30 CST. [The object appeared to be] 1/2 the size of the waxing moon, and broke into two major chucks with many smaller pieces. It had a 'white plasma' (sun-colored) look with a long golden tail." Fireballs like this are not uncommon, though they can provide a startling sight. Falling rocket debris sparked another fireball on Christmas Eve last year over Europe, while a meteor lit up the Alabama sky in October 2011, and skywatchers in the Southwestern United States were treated to a show in September. The term "fireball" is given to especially bright meteors that fly through Earth's atmosphere, but when these objects are observed in space, they are called meteoroids. Only those that enter the atmosphere to create glowing streaks across the sky are labeled meteors, and any fragments that reach ground are called meteorites.